Blizzard recently launched their 20th anniversary celebration for Diablo, accompanied by a suite of events for all of their current game franchises. For Diablo III, this included a recreation of Old Tristram, made to look as it looked in earlier games, framed around the concept that we were stepping into the memories of the witch Adria. She’s an important figure to the overarching story of Diablo, but also demonstrates a reflective moment of womanhood, twisted inside a stock narrative. When we think of female characters in videogames, the few that we hold up as positive examples are often ones that merely portray anything beyond a flat stereotype. Complicated women of all stripes, whether on the front of the box or as supporting characters, are always needed. The thing that I find so many of them struggle with, though, is containing some measure of truth to their experiences; while it’s reductive to think that every woman character could or should represent some parallel to what women go through in real life, there are still very few women in games who reflect an experience I’ve had personally. A lot of the reason for this is often because they are still penned or produced at every level by men. What could be moments of truth about things like parenthood, survival and struggle are often swept away within whatever grand narrative these writers attempt to tell. Adria has come as close as games get to being a female character with genuine complexity, even if the arc of her story ultimately fallsback into well-worn tropes. In the first Diablo, Adria is a witch living in a hut on the outskirts of town. 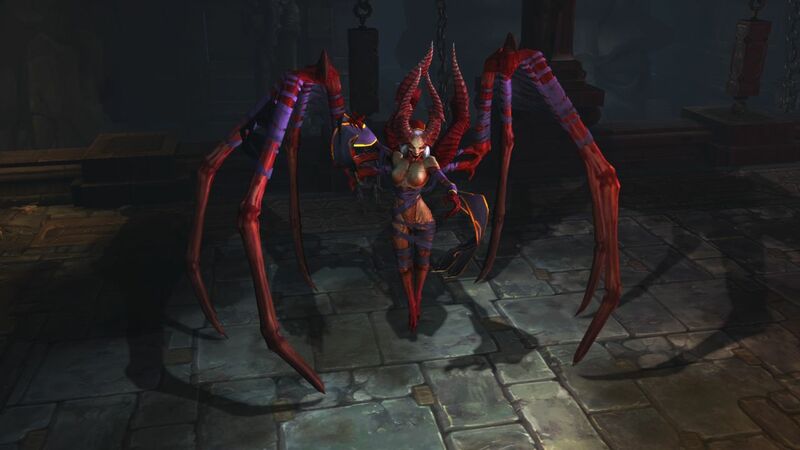 It isn’t until Diablo III that her story comes into focus as it’s revealed that she is the mother of the main character, Leah. 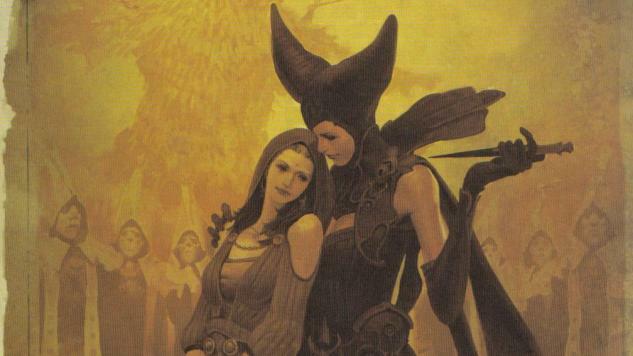 Adria takes Leah under her wing after being re-united, and you, as the player, help her and Leahpiece together the remaining Evils to imprison them within the Black Soulstone. However, she betrays you in the third act, revealing that she had been using you all along to usher Diablo into the world, now empowered by the other lesser evils. It’s a fairly shocking revelation when it happens, and turns a character who seemed mystical and morally grey into a villainess who uses her daughter as a vessel to end the world. It’s upsetting, taking one of the few women characters in the game and turning her into yet another enemy. What came next in the Reaper of Souls expansion is what gives me pause about Adria as a character. In the lead-up to finding Adria (who is now a boss) in her lair, you traverse the marshes outside of Westmarch, places that have been corrupted by Adria’s blood magic. It is here you can pick up a sequence of nine journals that reveal parts of Adria’s earlier life in her own words. It illuminates how Adria came to be,from dealing with a cold abusive father, to recognizing her own powers as a witch. It is this tiny change in the narrative that makes all the difference in how I see Adria and the arc of her life. The first time I saw a witch, she burned. Father took me to the town square to see it. “Look,” he said. “That is the face of evil.” But she looked like any other woman, and burned like anything else. Then the flames engulfed her, her eyes found mine, and she laughed. There’s a recognition in Adria’s words that perhaps the world of Sanctuary (the setting of Diablo games) is not fair to women, especially the wrong kind of women, witches. This other witch recognized Adria for who she was, a kindred spirit, long before Adria herself did. “Witch,” they called me. But I turned it against them. When their daughter had a child that needed to disappear, when there was a sickness that none of the healers could cure, who was it they pleaded with? When they needed me, the morality they flaunted in the daylight disappeared. As it always does. Adria embraces the life of a witch, despite it being a hard path. These journals illustrate a recognition that both the world of Diablo, as well as our own, can be unfair to women, can diminish them and treat them as others while still relying on them. They give an interesting weight to the world that, up until that point, had seemed relatively fair for everyone. Your character (no matter the gender) is poised in the middle of the conflict, their power unquestionable. Everyone else has prescribed roles, but here and there some inequalities emerge within the tiniest fragments in the narrative. It didn’t feel like sexism existed within the world; it always felt like things that trickled in from development. Adria’s fate, her choices, all become much more sympathetic and much less villainous when presented as a route to power that had serious consequences. She’s hated from the start, by her father, by other women, by the people she helps, and sees few options to thrive in this society. It’s no surprise that she might end up doing the things that she does. However, it’s also not surprising that what could have been a deeper story of gender politics via witchcraft is instead what leads to Adria’s monstrous villainy. Contemporary pop culture has persisted in making witchcraft a cautionary tale, one that others women and moralizes about the seduction of power, of reckless women being tempted by evil. Witches, like Adria, are normal women who need to be brought back to heel within the confines of society. Her own turn, bringing forth the greatest evil, buying into the narrative that she believes herself, and treating her daughter as if she were disposable, reinforces that women are expected to abide by a goodness that is determined by a male society. The relationships she has with men in her life embed this concept more fully, fromher abusive father, who she ends up killing with arson, to her love affair with the Dark Wanderer, who she pledges her body to. Adria’s acceptance of men’s mistreatment in turn makes her willing to mistreat and harm others. It’s a chilling feature wrapped around a traditional moral that comes up too often in fiction, that the abused turn into abusers themselves. Leah was never my daughter. She was Diablo’s daughter in truth. I felt blessed to have given the product of my body to my master. He had no interest in me, but in the product of my womb, he found life again. I never flinched when I knew her purpose. Daughters are a cheap thing. Adria’s life as a witch-turned-demon prophetess could have been a rare, complicated survivor narrative about women, but instead she’s reduced to one of the standard roles women are allowed to play in games: a selfish, cruel villain, and, worse, a footnote, something trampled underfoot for loot. There’s definitely room in games and other stories for bad, terrible women, and there are still many unexplored paths for media to present those kinds of characters. She is a woman with complexity but unfortunately the attempt to make her sympathetic, to explain and justify the motivations behind her actions, comes too late. For a moment, it felt like someone was trying to say something with Adria, both with the role she plays in the story and with the rare glimpse into a woman’s interior life. But like so many things in Diablo, that moment quickly passes, and the dusty tome is shut and left to be forgotten.